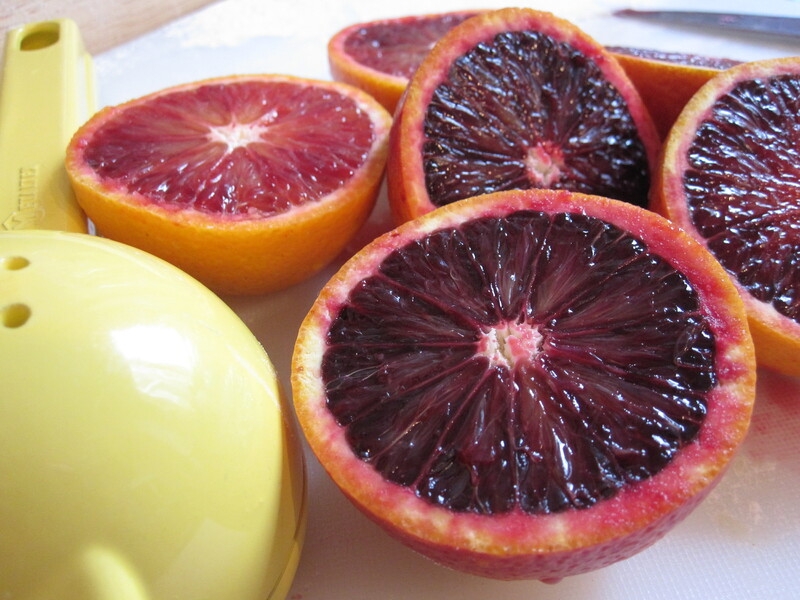 A blood orange is one sassy fruit. It defies the norm, dares to be different, and looks good doing it. I think maybe every orange citrus fruit secretly wishes it could be of the blood variety. There’s just something so alluring about the red blush on orange skin, and the deep red center that never ceases to amaze me each time I cut into one of these fiery beauties. Since noticing them at the farmers’ market a couple of weeks ago, I have been plotting a way to incorporate them into my baking exploits. I also just liked the idea of having a blog post with blood in the title (I grew up obsessed with cemeteries, witches, and The Addams Family and this morbid side of me continues to leak out in strange ways). The blood oranges do lend a particularly zesty flavor to this tart, and made the cooking process especially exciting since every step was just so pretty. I thought it strange that the custard lost the dusty rose hue it had before baking; I was really hoping the finished product would have the same deep reddish color as the fruit. But I’m sure there’s some scientific reason for all that. There’s probably also some scientific reason behind the fact that my custard didn’t quite turn out as custard-y as I had hoped (not sure if the heat was up high enough in the pot as I mixed it, or maybe I whisked too vigorously), and why my crust slipped a little too far down the sides of the pan, to the point where not all of the filling would fit. I’ll probably give this tart another go-round one day to see if I can improve on my past blunders. I don’t want to write it off just yet. Despite the fact that this tart didn’t turn out quite the way I had hoped (I also slept through the timer alarm and left it in the oven 15 minutes too long), I feel nonetheless that this recipe marks somewhat of a landmark moment for me: I have finally learned to pawn my baked goods off on others shortly after baking them (in this case, whisked off to a birthday potluck). No more consuming over a dozen cookies in 24 hours, or half a cream pie in one day. No, I have left those gluttonous days behind. I’ve finally come to accept the fact that I have little to no willpower when it comes to baked goods – even the ones that I declare to be minor disappointments. Mix together almond meal, flour, sugar, and salt and process until blended. Transfer to bowl and cut in butter with pastry cutter until mixture resembles coarse meal. Add egg and lightly toss. Add 1 tablespoon ice water at a time until moist clumps form (sprinkle more ice water as needed to gather dough together). Gather dough into a ball and flatten into a disk. Wrap in plastic and chill at least 1 hour and up to 1 day. Preheat oven to 375°. Roll out dough on floured surface to 12-inch round. Transfer to 9-inch-diameter tart pan. Fold dough overhang in, pressing to adhere and forming double-thick sides. Pierce dough all over with fork. Freeze 20 minutes. Bake crust until set and light golden, piercing with fork if crust bubbles, about 25-30 minutes. Cool completely. In a double boiler over simmering water (if you don’t have a double boiler, just use a metal bowl over a pot), whisk 3 eggs & 1 cup sugar until smooth. Add remaining ingredients and continue to gently whisk mixture until thickened, approximately 15 minutes. Don’t over-thicken as the filling will be cooked further. Taste for balance and if necessary add more lemon or sugar to suit your taste. Transfer to medium bowl and cover entire surface with plastic wrap. Be sure to press the plastic wrap right onto the curd or a film will develop. Cool in refrigerator until at least room temperature. Rinse, sort and dry 1 pint of blueberries. 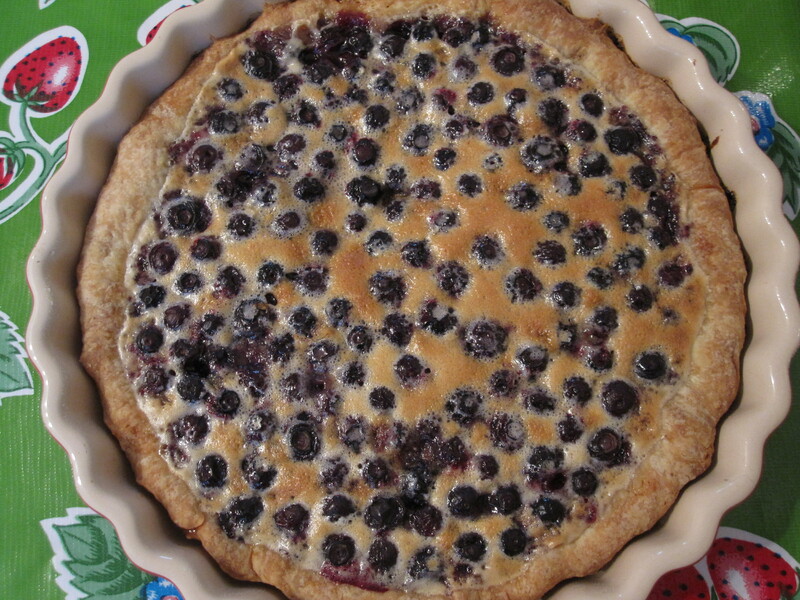 Arrange a layer of blueberries in the bottom of the cooled crust. Carefully pour the blood orange curd over the blueberries. Smooth filling to create an even layer. Bake at 350° for 25 to 30 minutes. Remove from oven to cooling rack. Let cool at least 1 hour before serving. 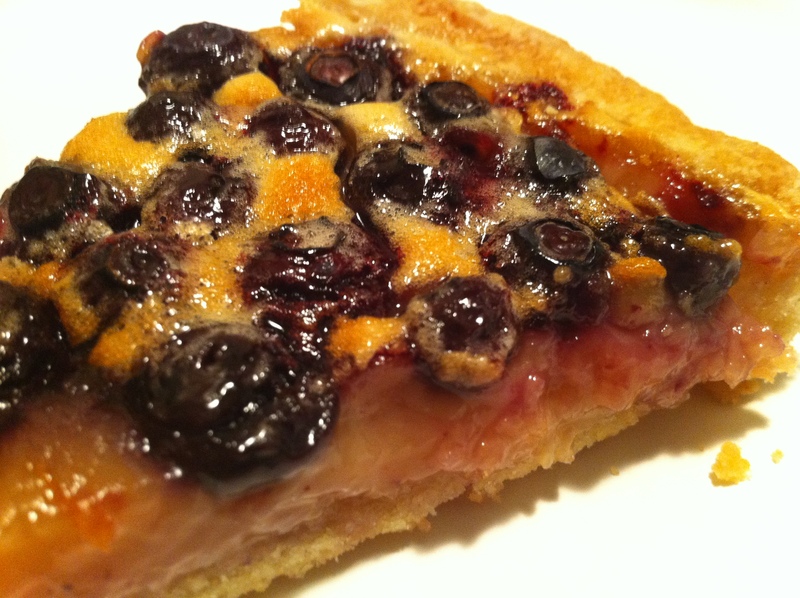 This entry was posted in Not pie and tagged almond crust, blood orange, blueberries, tart. Bookmark the permalink. ooooh you can pawn them off on me any day!! I can’t wait for our bake off in 1 month!!! YAY!